Viewing: Home › Post Tagged with: "South Africa"
Meanderings and tangents from a sunset spent in Durban. Three images from an incomplete photo essay examining the modernist architecture of Johannesburg’s inner city. Street portraits of Johannesburg's densely-populated Alexandra township. 10000 striking municipal workers take to the streets of Johannesburg. 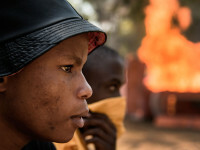 Police struggle to contain a violent protest in rural Mpumalanga. A Cessna flight from Johannesburg to rural Limpopo province. A torched car burns on the N3 motorway north of Johannesburg. Exploring the East Rand townships of Katlehong and Thokoza.